My big bird here is supposed to be a tengu ! I also have Macula, which is a shirime ! 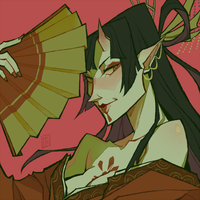 Anfisa is a futakuchi-onna//women with a mouth at the back of her head! Yuri is a bakeneko and his brother Keiichi is a nekomata! not based off of any specific yokai but she's inspired by japanese monsters! !